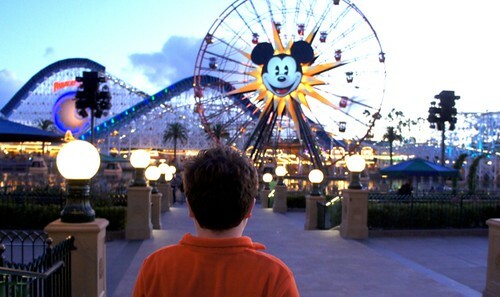 As many of us are planning summer excursions, here are the whys and hows of one autistic boy's successful trip to Disneyland. Leo hadn't been to Disneyland since 2004 because the interim years were challenging ones for him, behaviorally, and I wasn't sure if he and Disneyland were compatible. We plan Leo's excursions carefully and try to set him up to be a star, as when he's pushed past his tolerance levels he collapses, then goes supernova. That planning didn't seem entirely possible at Disneyland, plus I was worried about taking Leo to such a loud, bustling, potentially overwhelming place. But I also knew Disneyland was full of opportunities to immerse himself in beloved make believe worlds like Monsters, Inc., Toy Story, and Finding Nemo. The trip seemed worth the risk, and I figured we could always return to the hotel and go swimming if a retreat was in order. The characters were good with Leo as well. When Pluto approached him outside Space Mountain, my son used very direct vocalizations and gestures to discourage contact or any other interaction, and Pluto obliged graciously. 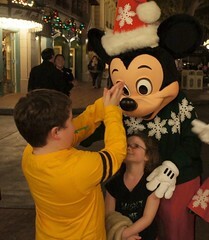 When Mickey Mouse approached, Leo grabbed his nose inquisitively -- and Mickey laughed. I so appreciate it when any person or creature respects and responds appropriately to Leo's communication, regardless of the form that communication takes. Several features that made our trip easier for Leo were simply great for families in general, like the on-site Grand Californian Hotel, which let us quickly walk back to our room and chill whenever we needed to. We were also allowed to check into our room early at no extra cost since the room was already ready -- though if it hadn't been ready they would have held our luggage for us while we played, also at no extra cost. Staying onsite meant it was easy to let Leo have his evening bath at the usual time -- a boy's gotta stick to some part of his routine while on vacation. But instead of going to bed afterward as he usually does, we dressed him in comfy clothes that could double as jammies and went right back to the park -- where he stayed up until 10:30 PM both nights, two hours past his usual bedtime. He didn't want to stop riding the rides, but eventually crashed. Hard. 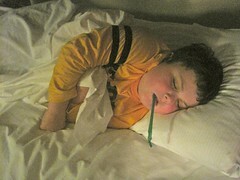 Without even taking the straw out of his mouth. "Have you tried to break a teacup yet? Last time I was there, Steven Shore & I almost broke a teacup. #sensoryseekers"
"The one bit of advice I'd give to any parent of a kid who's particularly sensitive to visual or aural stimuli is to start leaving the park well before the parade and fireworks. It was a whole heapin' helpin' of no fun to be dashing through the park against the huge crowd like a quarterback avoiding the defensive line with my kid howling at the noise and me trying desperately to keep my hands over his poor ears. It took almost forever to get to the main gate. It was a stupid mistake on my part not to have foreseen that difficulty, so I'm passing it on in hopes that other parents will be wiser than I was." Speaking of crowds -- as if I wasn't already horrified by them, Leo got swept away when we happened upon a post-show Disney throng. He remained missing for ten eternal minutes, during which I hyperventilated and almost died. But it turns out the Mouse has security everywhere, and that -- frighteningly -- kids like Leo get lost all the time, so they really know what to do and how to find them quickly (they caught our boy at the California Adventure exit, trying to get back to Star Tours). Turns out the gate attendants' idle chit chat is actually screening -- they don't let unaccompanied minors pass through checkpoints, especially if they can't tell the gatekeepers their name. And the security folks assured me that my visions of Leo jumping a fence into a lake or ride would never happen -- those invisible eyes would spot and prevent any such shenanigans. I will say that identification like SafetyTats or Oneida Medical Jewelry can help these situations resolve much faster. Though the parks themselves are set up well for people like Leo, we did lots of success-eliciting prep for the trip, too. 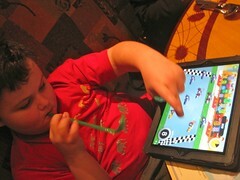 I made an iPad social story about visiting Disneyland, which Leo enjoyed. I used a shoulder bag that zips shut for easy and secure toting of Leo necessities, like light warm easily rolled bright orange fleece pullovers for warmth and visibility during cold fall nights. I brought lots of snacks with us. We let Leo wear his Crocs so I didn't have to worry about time-consuming and constant shoe putting-back-on. And I talked to a lot of people about autism at Disneyland we left -- bloggers, enthusiasts, and even park staff, so we'd have some ideas of what to expect. You probably already guessed the one bummer about our Disneyland visit: it wasn't cheap. The kids gave up their birthday parties in exchange; even so we only were able to go because of a sharp discount for low-season attendees. There are lots of other ways to reduce costs, but they also increased inconvenience, and I wasn't willing to introduce complications during Leo's Disney adventure. But oh my goodness, we will be going back. Somehow. Leo deserves that kind of happy, as often as we can make it happen.